This might come as a surprise to those who regard it as settled that addiction is ‘a chronic relapsing brain disease’, but this is not the unanimous view of scientists, academics and professionals interested in addiction. There is a dissatisfaction with the ‘official’ portrayal of addiction and a desire for a more realistic, genuinely scientific account of this ubiquitous human problem. Two polarised views of addiction, and the seemingly endless dispute between them, go way back. The ‘moral’ view, emerging from pre-industrial times, is that what we would now call addictive behaviour represents a free choice, similar to all the other apparently autonomous choices people make every day and are fully responsible for. Although most clearly associated with a pre-scientific mode of thinking, the moral view of addiction also finds expression in the work of scientists, an influential example being the The Myth of Addiction by my friend John B. Davies (who died while this article was in press – see obituary). At the opposite extreme is the disease view, beginning in the early 19th century and culminating in its latest manifestation, the brain disease model of addiction. 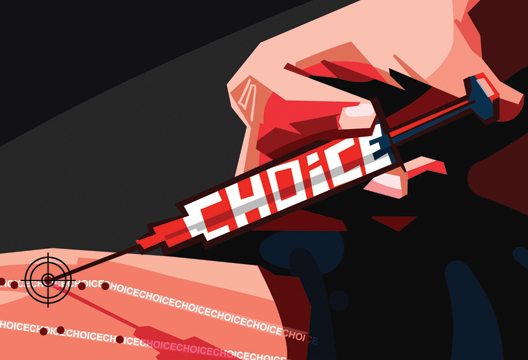 This conceptualises addictive behaviour as completely involuntary and against the will of the person: addicts do not ‘use’ because they choose to, but because they are compelled to. This characterisation of addiction is now so common among scientists and professionals that to challenge it seems heretical. But, as we shall see, there is a mountain of evidence against the view that addictive behaviour is compulsive in any straightforward sense. A recent collection of essays I edited with Gabriel Segal (Heather & Segal, 2017) explores the ‘middle ground’ between completely free choice and no choice. The overall message is the need for a third stage, superseding the moral and disease stages, in our understanding of addiction. An interdisciplinary mix of contributors from philosophy, neuroscience, psychology, psychiatry and the law hold out the promise that these ostensibly different perspectives might one day converge on a unifying model of addiction. However, the contribution of philosophers is central to the task of rethinking. As Daniel Dennett wrote in Darwin’s Dangerous Idea, ‘ there is no such thing as philosophy-free science; there is only science whose philosophical baggage is taken on board without examination’ (p.21). Any task of rethinking must begin with a fundamental definition. For some time now, laypeople and academics alike have extended the use of the term beyond substance addictions to a wide range of repetitive activities, to the point where it often seems to mean little more than ‘something people spend a lot of time doing’. There are indeed good grounds for seeing some forms of repetitive and harmful non-substance behaviours, like problem gambling, as ‘behavioural addictions’ – but we need a criterion for distinguishing those behaviours usefully thought of as addictions from those that are not. We need a litmus test. My proposed test is: ‘A person is addicted to a specified behaviour if they have demonstrated repeated and continuing failures to refrain from or radically reduce the behaviour despite prior resolutions to do so.’ The resolutions in question can be more precisely defined by adopting Richard Holton’s phrase, ‘contrary-inclination-defeating intentions’. That is, the resolution is made ‘in the attempt to overcome contrary desires that one believes one will have when the time comes to act’ (Holton, 2009, p.77). This doesn’t mean that I regard other accepted features of addiction – craving, preoccupation with the object of desire, failure to carry out major role obligations, acquired tolerance and physiological withdrawal, and other ‘symptoms’ found in DSM or ICD categorisations – as unimportant or uninteresting. I only claim that the leading question that should capture our theoretical attention is why addiction is so ‘sticky’, why addicts find it so hard to change their behaviour. The crux of the disease view, that addictive behaviour is carried out against the will of the addicted individual, leads to the conclusion that addicts should not be blamed or punished for the transgression of legal and social norms associated with their addictive behaviour. Instead, they must receive compassion and treatment. This message is, of course, the basis of longstanding communications to the general public and policy-makers and, despite the origins of the disease theory of addiction at least 200 years ago, is still promoted as a mark of up-to-date, enlightened opinion: addiction really is a disease and sufferers from it can’t help behaving the way they do. But is it true that addictive behaviour is compulsive? Is there evidence that bears on this question? There certainly is (and the interested reader is referred to Heather, 2017a, for more). A series of laboratory experiments in the 1960s and 70s showed conclusively that the drinking of even the most chronic and severe alcohol addicts found in institutional settings was operant behaviour that was largely determined by its consequences. Rather than being qualitatively different and compelled, alcohol addicts’ drinking behaviour is subject to the same general laws that govern normal, goal-directed, voluntary behaviour of any sort. More recently, a demonstration of the power of alternative reinforcers to modify cocaine use in experienced cocaine smokers recruited from the community was carried out by Carl Hart and his colleagues (outlined in his book High Price). What is remarkable about these findings is that, among individuals who in the mainstream media and in many conventional scientific and professional circles would be regarded as hopelessly addicted to crack cocaine, a relatively small amount of money could be effective in persuading them to reject the choice of cocaine. Indeed, as shown by a large number of randomised controlled trials, the most efficacious method of treatment for addictive behaviours is contingency management (CM). This evidence further supports the conclusion that addictive behaviour is not impervious to its consequences. Studies of CM programmes with physicians, airline pilots and other professional groups have reported truly remarkable results, but similarly high rates of recovery have been obtained among much less privileged groups (see DuPont and Humphreys’ editorial in a 2011 edition of Substance Abuse). The idea of compulsion also implies that addictive behaviour is inflexible, stereotyped and unreflective but, in her qualitative study of drug users (mostly heroin) in Scotland, Joanne Neale found a very different picture. Rather than helpless victims of forces over which they had little or no control, Neale’s respondents were typically self-respecting and self-determining individuals ‘who actively confronted and purposefully responded to external constraints and life opportunities’. If addiction entails compulsive behaviour, it is reasonable to expect that addicts would take a long time to recover, if they ever did. In a 2009 book Gene Heyman and colleagues examined data from four large-scale, longitudinal surveys of the general population in the USA carried out at various times since 1980. Among all respondents who had ever met DSM criteria for substance dependence in their lifetime, between 76 per cent and 83 per cent were in remission (i.e. showed no evidence of dependence in the past year). For the great majority of respondents, remission was achieved without benefit of treatment. It is surely incompatible with the notion of a compulsive, chronic disease that over three quarters of those who had ever suffered from it no longer did so, and despite never having received treatment. One of the most sensational pieces of evidence bearing on the nature of addiction comes from a follow-up of veterans of the Vietnam War. Towards the end of the war, the US government became alarmed about reports that a large proportion of American servicemen in Vietnam were addicted to heroin or other drugs. A team of researchers led by Lee N. Robins was commissioned to interview a large sample of men in Vietnam to determine the extent and characteristics of their drug use, and then to follow them up on their return to the US after discharge in 1971. Against all expectations, the great majority had simply ‘given up’ addiction. In the first year after return, only 5 per cent of those who had been addicted in Vietnam were addicted in the US; and despite reports of withdrawal symptoms, 88 per cent had not resumed regular use of opiates at a three-year follow-up. This did not occur because drugs were unavailable after return home; interviewees reported that they knew how to obtain heroin and some had occasionally, but not regularly, used. Now, there may be senses in which it is valid to describe the phenomenology of addiction as if compulsive, but the evidence flatly contradicts any notion of compulsion in the strong sense of automatic behaviour elicited involuntarily by drug-related cues independently of the person’s motivational status at the time it occurs. Compulsion may have some traction in a weaker sense of the addict’s experience of feeling unable to resist powerful temptations to use, but this is not a sufficient condition for relapse to occur, as shown simply by the fact that addicts do occasionally successfully resist. It is true that some addicts don’t change their behaviour before irreversible damage has been done, but to say that this shows they are compelled to continue using and can’t change is a fine example of circular reasoning. Unfortunately, rather than try to accommodate the evidence above, neurobiological theories of addiction, based on the assumption that addiction is compulsive due to a chronic brain disease, simply ignore it. This is the main reason for accusing such theories of being unscientific. Despite the obvious trappings of science – colourful pictures of the brain based on expensive neuroimaging techniques, intricate diagrams illustrating complex neurological circuits held to be involved in compulsive behaviour, innumerable experimental manipulations of the brains of rodents – there seems to be no interest in linking hypothesised brain mechanisms with the large body of observations of the behaviour of human addicts in the real world. Equally unfortunately, the evidence in question has misled some, as we have seen, to dismiss the concept of addiction itself and to regard it as a myth. Although addictive behaviour is not ‘against the will’ in any simple sense, it is still a disorder of some kind and there is still something in the addict’s supremely irrational behaviour that requires a special explanation. This is consistent with another view of addiction that sees it primarily as a disorder of self-regulation. As we have seen, the crucial task in the study of addiction is to account for the breakdown of a resolution at the point at which the addict succumbs to temptation. What are the key determinants of this breakdown? Conversely, how do we ever succeed in persisting with our resolutions in the face of strong contrary inclinations? These are ancient questions but the suggestion here is that they must continue to be given prominence in scientific inquiry into addiction. Seeing addiction as a disorder of choice or of self-regulation can be subsumed under the more general proposal that addiction can be explained within the framework of a dual-systems theory of human behaviour and experience, a proposal that is by no means new (see, for example, references in Chapter 25 of Heather & Segal, 2017). Though there are different versions of dual-systems theory, they all provide an account of how behaviour can be the result of one of two different systems for information processing and of their interaction – one dealing with implicit, automatic and mainly non-conscious processes and the other with explicit, controlled and mainly conscious processes. In addiction, the balance between the two systems has become disturbed. Automatic processes, like cue-elicited urges, attentional bias, automatic approach tendencies, implicit memory associations and cognitions promote the maintenance of addictive behaviour, while poor goal-directed planning, limited self-control capacity and distorted judgements and evaluations undermine attempts to resist it. The ‘final common pathway’ of overt behaviour has become biased in favour of automatic processes. In sum, a dual systems theory of addiction is an attempt to understand what Ron Borland, in his 2014 book Understanding Hard to Maintain Behaviour Change, calls ‘the constraints on and the potential of volitional attempts to change behaviour patterns that are under the moment-to-moment control of non-volitional processes’. The crucial point, however, is summarised in a 2015 editorial in Addictive Behaviors by Marcantonio Spada and colleagues thus: ‘…the exercise of volition is not lost to the automaticity and irresistibility of addictive responses, but rather…can be employed to decide whether to comply and satisfy, or to deny and abstain’. No sensible observer would discount the contribution that neuroscience has made, and will continue to make, to the understanding of addiction. But there are severe and inherent limitations to what neuroscience alone can tell us about the disorder. No theory consisting of descriptions of the activity of neurotransmitters, synapses and neural pathways can ever amount to an adequate account of addiction. To believe otherwise is to subscribe to what Dennett has called ‘greedy reductionism’, the kind that believes more basic levels of explanation, such as the neuronal, can make redundant higher levels couched for example in psychological and social terms. This is the most general reason for believing that regarding addiction as a disease of the brain, like Parkinsonism, epilepsy or Alzheimer’s disease, is a fundamental mistake. Distinguished neuroscientists themselves share this view. Harold Kalant (2010) has shown that the postulation of neural mechanisms given causal roles in the portrayal of addiction as a brain disease caused by chronic exposure to drugs has not been experimentally or clinically supported. Recently, in his 2015 book The Biology of Desire, Marc Lewis has argued that the brain changes all the time and that the changes brought about by chronic drug ingestion are similar in kind to learning any new habit or way of behaving. Lewis presents a developmental-learning model of addiction in which recovery, rather than representing a return to some previous level of stability or homeostasis, marks a stage of growth beyond addiction. A defence of the brain disease model of addiction (BDMA) was provided in the New England Journal of Medicine in 2016 by Nora Volkow, the current Director of the National Institute on Drug Abuse in the USA, and her colleagues. However, critics of the BDMA fall roughly into two camps: those who maintain that addiction is not just a brain disease, implying that if the psychological, social and cultural influences on addiction were fully recognised, the notion of brain disease would be acceptable; and those who argue that addiction is not best regarded as a brain disease of any kind. I am in the latter camp. Addictive behaviour is volitional at the time it is carried out; addicts are agents who make choices. This doesn’t sound like a ‘disease’: whatever disagreement there may be about the meaning of the word, a disease is surely something that happens to us, not something we do. It may be useful to describe automatic processes involved in addiction at the lower system level as representing a disease – the drug withdrawal syndrome, for example, is obviously a disease – but it does not follow that the interplay between volitional and non-volitional processes that constitute the addict’s predicament is usefully described as a disease. The dispute about whether or not addiction is a disease should eventually be resolved by examining the consequences of holding one view or the other. I have tried to show that one consequence of the disease view is that it limits the chances for an adequate understanding of addiction. There are more practical consequences too. A claim frequently heard from supporters of the BDMA is that its promotion is the only way the public can be persuaded to withhold blame and punishment from addicts, the only way to combat the stigma they suffer. It follows that a rejection of the BDMA is equivalent to promoting the idea that addiction signifies a moral failing on the addict’s part. This is an entirely spurious claim (see Heather, 2017b). It is obviously possible to develop a scientific account of addiction which is neither a disease nor a moral model but which the public could understand. There is good evidence that public acceptance of the disease concept is largely lip-service and that the claim the BDMA removes stigma among public or professionals is untrue. That someone’s aberrant behaviour is caused by a disease of the brain is surely one of the most stigmatising things one can believe. There may be difficulties in communicating a morally neutral, non-brain disease account of addiction to the public but, if we are to make progress in understanding and responding to the disorder, there is no alternative. On the other hand, there are clear disadvantages to promoting the BDMA. The main practical advance anticipated by its supporters is the development of new pharmacological substances and other medical procedures to correct the putative brain malfunction responsible for the disease. There is no question that pharmacotherapy has a role to play in addiction treatment, mainly by making possible a period of stability in which problems in relationships, accommodation, livelihood etc., may be addressed. But this essential period of stability leaves the more lasting problem of the self-regulation of behaviour largely untouched; any long-lasting solution to this problem can only be achieved by learning ways to strengthen control over addictive behaviour, whether by cognitive-behavioural therapy, mindfulness training, membership of a mutual aid group, or any other relevant method. By contrast, the argument to the public and to governments put by BDMA advocates that the development of new medications for the brain disease of addiction is the only way forward is likely to result, not in any miracle cure, but to an increase in the over-medicalisation of personal and social problems many of us fear. As Wayne Hall and colleagues (2015) have argued, it is also likely to result in a continued neglect of what is the best way forward – the application of public health policies aimed at reducing harmful drug use in the general population, and ways of increasing access to cheap and effective treatments that already exist. Another important disadvantage of the BDMA is that it may reduce addicts’ chances of recovery by telling them that they are powerless to change without special help. This is based on the assumption that people’s belief in their capacity to change is the single greatest factor in bringing that change about, and this is, of course, an underlying principle of modern cognitive-behavioural therapy, repeatedly shown to be the most empirically well-supported modality of treatment for behavioural disorders. It seems likely that the language of irreversible brain disease and of compulsion is a strong disincentive to self-change and to the success of treatment aimed at helping people change. We therefore need a radical transformation in communications to the public about addiction, one in which they are persuaded to believe that breaking free from addiction is possible and told what we know about how this can be successfully accomplished. A 2014 editorial in Nature prompted 94 academics and researchers to protest against its ‘one-dimensional’ view of addiction. Derek Heim and I then set up a Google group, the Addiction Theory Network, to coordinate criticism of the brain disease model and to develop alternative ways of understanding addiction. See tinyurl.com/hn7f3qs and apply to join the network. Hall, W., Carter, A. & Forlini, C. (2015). Brain disease model of addiction: Misplaced priorities? Lancet Psychiatry, 2, 867. Heather, N. & Segal, G. (2017). Addiction and choice: Rethinking the relationship. Oxford: Oxford University Press. Heyman, G.M. (2009). Addiction: A disorder of choice. Cambridge, MA: Harvard University Press. Kalant, H. (2010). What neurobiology cannot tell us about addiction. Addiction, 105, 780–789. Levy, N. (Ed.) (2013). Addiction and self-control: Perspectives from philosophy, psychology and neuroscience. Oxford: Oxford University Press. Wiens, T.K. & Walker, L.J. (2015). The chronic disease concept of addiction: Helpful or harmful? Addiction Research & Theory, 23, 309–321. Wiers, R.W. & Stacy, A.W. (Eds.) (2006). Handbook of implicit cognition and addiction. Thousand Oaks, CA: Sage. A need for anything is an emotion. If our lives are in a mess we look for something to ease the anxiety - it could be alcohol or drugs or even gambling, taking us away from our present position. This all seems logical and easy to understand why. Some people are more vulnerable than others, sum can handle more pressures than others. Why. Our basic emotions are hereditary. If one of our parents were of nervous disposition or were alcoholic we would have a 50% chance of inheriting poor emotions. Evolution tells us that we gratually, over generations, adjust to our environment so by abusing our bodies we are, in my opinion, possibly passing poor emotions on to our children. This where, in my opinion, we should be looking to solve the problem of fobias, addictions and emotional problems.